DIMA offers courses for various Bachelor's study programs, e.g. Computer Science (Informatik), Business Informatics (Wirtschaftsinformatik), Computer Engineering (Techn. Informatik), or Industrial Engineering (Wirtschaftsingenieurwesen). Our graduate courses provide an ideal foundation for software engineering oriented students. They enable to understand the background and theory of database systems and information management, and, finally, to design and implement database applications and complex information management solutions. You find the detailed, current descrictions of our courses in the MOSES Moduldatenbank, as well as the course lists (Modullisten) of your study programme with mandatory modules, mandatory electives and optional modules. 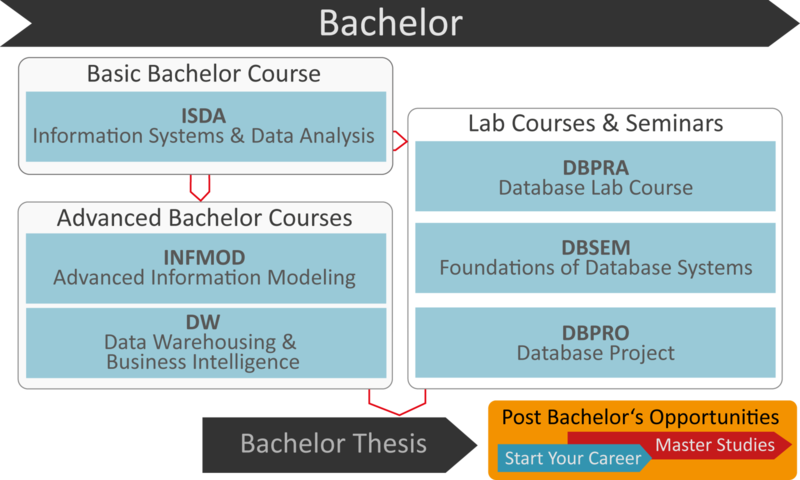 Here you find a short description of our modules of Bachelor offers with focus on Database Systems and Information Management. Goal of this module is the practical application of the theoretical content of the database lecture "Information Systems and Data Analytics". The practical applications include use of SQL as data definition, data manipulation, and authorization language, and the embedding of SQL into another programming language. Furthermore, the process architecture of database systems and the basics of database administration (e.g. building indexes or materialized views, analysis of query plans and query optimization based on statistics) are taught. For the lab work, a commercial object-relational database system is used. As programming language we use Java and JDBC to communicate with the database system. During the initial phase of this class, students will hear presentations on how to read scientific papers, how to give a good presentation, and how to write high-quality scientific/technical reports. Additionally, all participants will receive one or more top-ranked scientific articles, from the literature in the classical database area. E.g. paper from the Red Book, the Great Papers in Computer Science, VLDB 10-Year Best Paper Awards, or SIGMOD Test of Time Awards. Task of the students is to study the literature deeply, to structure own presentations, and to reflect the main challenges addressed in the presentations and in a written summary. The contributions of the other students shall be critically reflected by the audience - like own contribution. At the beginning of the course you will receive a project task description from which you first create an overall system specification. Then, you design, specify (detailed), and finally implement the components of the system. Finally, you integrate and test the system and present your work as part of a system demonstration. The technologies used depend on the project. Usually, Java, relational and NoSQL database systems, indexing, and visualization software are used. For the implementation of the project you are advised to use computerized tools for effective management and implementation of the project, particularly for efficient co-operation, source code management, automated testing and generation of documentation. At the end of the project, the approach, results and tests have to be documented in form of a project report. The project will be completed by the system demonstration and an oral exam. Data Warehouses (DWH) store big amounts of data in databases designed with a focus in data analysis. Business Intelligence is the process of extracting information from DWH with the purpose of enabling decision support. The lecture introduce these topics with an emphasis in data analysis. In particular DWH architectures and components, differences between "normal" databases and DWH, integration of data in a DWH, the multidimensional data model as well as selected methods for analysis in relational DWH. The previous topics will be put in practice with the help of relational database management system (DBMS) (for example IBM DB2 or Business Objects XI 3.0). DIMA thesis opportunities provide students with challenging research problems and enable them to collaborate with national and international research partners. DIMA regularly offers numerous Bachelor‘s thesis opportunities, often tied to ongoing research projects from various fields.